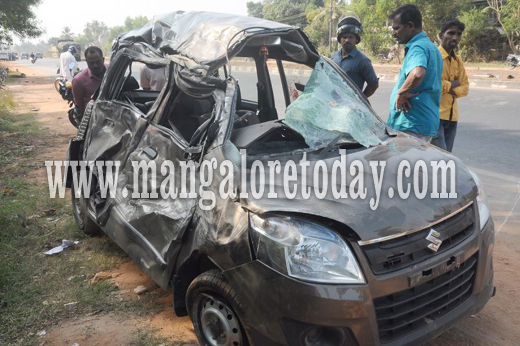 Kundapur, Jan 9,2017 : The driver of a WagonR lost his life while three others in the vehicle sustained injuries when their four-wheeler rammed against a Fortuner at Kannukere near Kota on the NH 66 late night on January 8, Sunday. The deceased person is Shibu(33) of Kerala origin. The WagonR was heading towards Kundapur from Kerala when its driver lost control over the vehicle which hit the median and swerved to the extreme side of the road in the process hitting an oncoming Fortuner vehicle. Kota police have registered a case.